Welcome toTara's Wharf is an ideal space for family vacations and celebrations as well as for professionally catered events. Bask in the sun on our spacious semi-private decks or relax in the shade of the south deck Solarium. Just steps away from Rainy Lake gives easy access for boat launching or dock fishing. Tackle the terrain on foot, bicycle or even snowmobile. The best trails begin here! Check out the village boutiques and local festivals occurring year round. 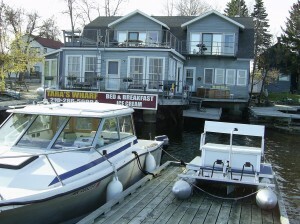 As an irresistible bonus, the Ice Cream Shoppe at Tara's Wharf is a definite crowd pleaser! Located 2 miles from International Falls off HWY 11 East Turn Left at county road 20 at the voyageur statue Continue until water.